Sonoma Scent Studio is a line created by indie perfumer Laurie Erickson. They aren’t that easy to get hold of if you’re outside the United States as the company won’t ship internationally but if you can find them, it is a line well worth exploring. Some really don’t suit me, but others are just glorious. It’s not a natural perfume line (though some of the scents are made with all-natural ingredients) but, of the six scents I’ve tried to date, even the ones that use synthetics have a ‘natural’ feel to them. That doesn’t mean they aren’t long-lasting though – as a whole, this line has some of the best longevity that I’ve come across, and a little goes a long way. Today I’m going to talk about one of SSS’s rose-violet scents. Nostalgie opens on the skin as a gentle, woody-floral, aldehydic scent – something traditionally ‘perfumey’, but softly so. Half an hour into its development it is a powdery rose, with a hint of violet, a beautiful cosmetics smell, but less sweet, more natural, and altogether less in-your-face than, say, Frederic Malle’s Lipstick Rose. While the violet-rose combination in Lipstick Rose is backed by a sweet, slightly plasticky almond, in Nostalgie, it’s backed by a mossy beeswax spiked with a little vetiver. Nostalgie is a very appropriate name for this romantic fragrance, which conjures soft-focus images of an Edwardian beauty. She’s dressed in white and sitting in a sunny garden amid blooming flowers, bees and butterflies. This, to me, is the scent of Lucy Honeychurch in A Room with a View. 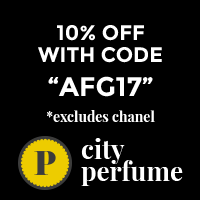 Someone on Fragrantica likened it to Chanel’s No. 22, and I can see why – they share a sweet, floral, beeswaxy feel. But, while Nostalgie has aldehydes, they are little fluffy kitten aldehydes. Nostalgie has none of No. 22’s fizzy champagne rush attacking the nose. It’s all soft, powdery florals. As the scent wears on, the sweet violet shows more of its face. Sweet, but not at all cloyingly so, it is a bit like Palma Violet candy, though the fragrance is as much about rose as violet. The base is gentle sandalwood, with a touch of moss, patchouli and vetiver, which combine with the beeswax to give the scent a gentle old-school furniture polish vibe. I love it. Very much a classic floral, and traditionally feminine, but (to my mind, at least) there is no reason that a man who likes powdery, floral fragrances couldn’t wear Nostalgie. It doesn’t have huge projection, but is still detectable on my skin an impressive 14-16 hours after application. SSS has another couple of rose-violet-aldehyde scents that I have tried. To Dream has more of the woody and incense notes that the house is famous for, while Lieu de Reves has notes up front (perhaps the combination of cedar and vetiver) that remind me of cola – in a good way. They both strike me as less rosy, and less floral altogether, though Lieu de Reves still has plenty of powdery violet in its heart. I tend to like, or at least appreciate, almost all the scents I smell from this range, and this one sounds lovely as well. Nothing like a scent that just gives you that sense of comfort. Lovely is just the word for this scent. Laurie certainly knows how to work violets, roses and woody notes. Hee hee 🙂 Are you tempted to try more? I haven’t loved everything I’ve sampled from the line (Cocoa Sandalwood didn’t work on my skin at all) but the fact that these fragrances have inspired strong reactions in me, whether good or bad, just makes me want to sample more. I really like a few SSS perfumes. I haven’t sampled this one yet. I’m not sure if it would be for me. I do like Chanel No.22 so maybe I should give it a sniff. Hi Poodle. It’s definitely worth a sniff if you have the opportunity. It’s much less soapy and aldehydic than No.22 though. I do well with aldehydes, but I don’t get on with No. 22 – it’s a strange texture sort of thing. Wearing it feels like trying to eat sugar crystals (ugh). Nostalgie is so gentle, though. And that rich base is really comfortable. LOVE Tabac Aurea. Champagne de Bois is wonderful, so are Velvet Rose and Jour Ensoleille. Now awaiting a sample of Yin and Ylang, can’t wait for that. Thanks so much for the lovely review, Sarah! Glad you liked Nostalgie! STC is another place to get SSS samples/decants (they ship internationally). My post office is quite strict and I can’t do it right now. Mals, that sample should have arrived by now; I’ll email you and get another out. Thanks for making such a beautiful perfume Laurie! Post office restrictions really do put a damper on things, but thanks also for noting that STC is another possibility for those of us not in the US. Mals, I love Tabac Aurea too. I’d love to hear what you think of Yin and Ylang when you get it. It sounds wonderful. I love SSS, and I hope to try each and every one of the line. They are complex and resonate deeply within me. I am thrilled with Laurie also, who I admire immensely. I have a genuine sense of joy both in wearing her fragrances and encouraging her in all her endeavors. Thanks for the review, Sarah! Thanks for reading Holly 🙂 What is your favourite SSS fragrance of those you’ve tried so far? I adore Forest Walk, Velvet Rose and Voile de Violette. Laurie sent me a free sample of Incense Pure, and I was blown away by that one as well. If Yin and Ylang had been available, I would have included that in my order as ylang ylang is a favorite scent of mine. It’s not very popular , and I haven’t liked anything with that note yet except for the eo. So I’m looking forward to that one. I tried Nostalgie. The rose was the strongest part for me. I couldn’t decide how I felt about it, so I decided to try it again. Thanks for the reminder! Friends LOVED it on me. Compliments from friends are always a very good sign!